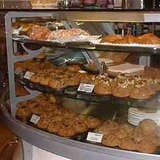 Muffinski's do some of the best tastes-like-home-made-only-better muffins in London. In fact if you spent a year baking muffins at home at the rate of a batch a day you still might not get them this good – these guys know muffins. They have many different muffin recipes under their proverbial belts and each day you'll find a different selection welcoming you into the little Covent Garden store: low fat and sugar free for the health concious – that don't taste like you're missing out on anything, cheesy, wholemeally savoury types, and of course the chocolatey, fruity, banana-y, gingery classics for real muffin fans. These aren't cakes masquerading as muffins, mind, these are proper, chunky, hard on the outside soft and flaky on the inside muffins. They also do frozen yoghurts made by mixing plain frozen yoghurt with cubes of frozen fruit – you can opt for just one kind of fruit or create your own bespoke mix, it's all done right there in front of you. They do other things as well – like coffee – but it all pales in comparison to these two highlights - one for winter one for summer. Sounds like one to put on the list. The name alone makes me want to go there. I also recommend taking your muffin or frogurt and eating it in the church yard behind the cafe.